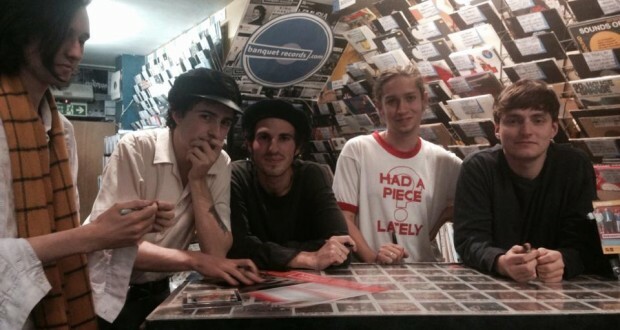 Indie pop band, Swim Deep, played an acoustic set at Banquet Records, Kingston, yesterday before heading off for another performance at a New Slang night in Hippodrome, just days after releasing their second album. Band members include lead singer Austin Williams, Tom Higgins (guitar), Zachary Robinsons (drums), Cavan McCarthy (Bass) and James Balmont (keys and percussion). The band played a handful of songs from their new album, Mothers, which was released October 2, kicking off with the acoustic version of one of their most popular tracks To my Brother, which was released as a single back in February. The track has an influence of acid house music which was apparent even in the acoustic version with its ghostly tones. The music had a delicate sound which echoed and bounced off the walls of the store. The enclosed space combined with live sounds from the instruments, created a very personal and chilled out vibe, which enabled the crowd to focus purely on the music and Austin’s dreamy voice. Maria Short, a 14-year-old student, said: “I like the way their music is really chilled but so upbeat at the same time”. The atmosphere was relaxed, the music was clear and clean cut, especially with the influence of the tambourine and keyboard. The band did a fantastic job at communicating with the audience, who swayed to the beat and seemed to be sucked into the simple but effective bass patterns. The eerie effect each piece had on the audience and atmosphere in the store proved that Swim Deep had thought about every word and sound in each track. After the short set the band spent some time chatting to their fans, taking photos and signing their albums. “The gig was really intimate and we got to meet them after for an album signing,” said Emily Richardson, 14. “I like the songs To My Brother and Namaste”. The atmosphere at Hippodrome was much different to that of the more relaxing atmosphere in the store, but no less satisfying. The band hyped up the crowd sang their lyrics back at them. Jessica Tollet, 20 said: “I enjoyed the instore earlier, but the atmosphere here was much more lively and jumpy. I love the guys’ new album and can’t wait to see what they’re going to come out with next”. Differentiating slightly from the first album, Where the Heaven are we, the overall style of Mothers, produced by Chess Club/RCA, gives off a more intense sense of euphoria which is dream-like and appeals to a wide group of consumers. Although each of the eleven tracks has the signature Swim Deep sound, the structure of each track has been made in a way which makes each one have its own unique edge. Swim Deep will continue to tour for the next couple of months, but their plans for the future are unclear as of yet.